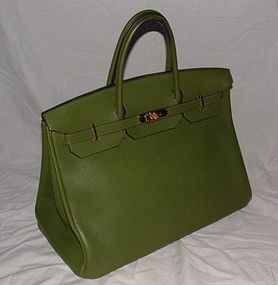 Authentic Hermes Birkin Bag 40cm Green Togo Leather Purchased from the NYC Hermes Store, receipt included. Comes with lock, keys, clochette (never used, never attached to bag). Includes original dustbag, smaller dustbag for lock, keys, clochette, cadena, and original box. The back of the strap has 252 and a D imprinted on it. Excellent, amazing condition, no scratches inside or out. On the outside, the only signs of wear are on the handles, and the corners (see photos in this listing as well as the photos in the other listing of this bag). Some imprint marks on inside bottom of bag, otherwise, the inside is pristine. Authenticated by the purseforum (www.purseforum.com) in January 2011. This bag has never had an Hermes "spa treatment." Returnable for FULL refund if found by Hermes NYC or Paris to be NOT authentic. Many more photos, serious inquiries only, please. LAYAWAY plan available, payment by ESCROW, money order, or check.